Hello and welcome to my weekly post on this week’s NBA action. Sorry I missed last week, but I’ll be sure to post more regularly. Here we go! 1. Who gets the #1 Seed in the East? It’s going to come down to either the Miami Heat or the Indiana Pacers, and as far as I’m concerned the Toronto Raptors aren’t going to jump out of the blue and steal this (the #3 team in the East). Indiana has lost two straight (to the Golden State Warriors and Charlotte Bobcats), but so have the Heat. I know Miami just came off a blowout loss to the San Antonio Spurs, but they are more likely than not going to win this. They’ve pretty much got smooth sailing from this point onward, and Indiana has a much stronger schedule. Let’s go to #2. 2. Who will win MVP? Sorry folks that will be my last photo of LeBron. I don’t know if you’ve heard about his 61-burger he threw down on the Bobcats on Monday but man that was epic. Sure it was the Bobcats, but still he sent a message to Durant that he won’t be backing down from a 5th MVP anytime soon. 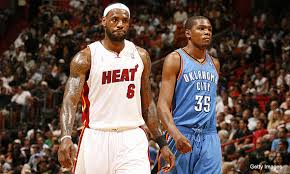 LeBron may not have reestablished himself as the frontrunner in the MVP discussion, but I’m pretty confident he’s tied with Durant at this point. If LeBron is able to put up consistent performances like he did this Monday expect him to run away with the trophy, if not then Durant will probably get it. 3. What the HE## is going on in the Western Conference? I’m going to show you the top 8 playoff spots. There is a giant logjam at #3. The Portland Trail Blazers, Houston Rockets, and Los Angeles Clippers are all tied at that spot. Meanwhile Dallas (the worst playoff team) is only ten games out. This thing isn’t over, and things could still get shaken up quite a bit. As far as I’m concerned though, the Thunder or Spurs will probably take that #1 spot considering the talent and team chemistry both those teams have. I’m still going for a Heat/Rockets Finals though. 4. Where will Carmelo end up after this Year? Bulls center Joakim Noah pleaded to Melo during the All-Star break to sign with the Chicago Bulls. There’s also a chance he could sign with the Los Angeles Lakers as well. The 2014 Free Agency Period after the season is a big opportunity for teams to grab future superstars. While we’re at it, where will LeBron go? He could stay with the Heat or return to Cleveland. He’ll probably stay with the Heat but you never know. Now getting back to Melo. 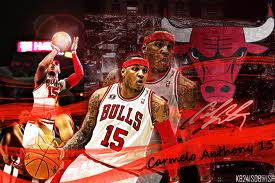 If he signs with the Bulls they will have a lineup that features Derrick Rose, Carlos Boozer, and Joakim Noah. That is a very scary team and it might even be enough to knock the Heat off their rocker should they win it again this year. On to our final point. It’s pretty terrible right now. The worst playoff team in the West would be the #3 Seed in the East. 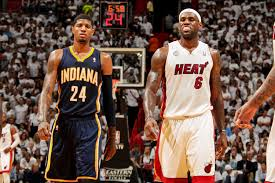 In all likelihood it will probably be a Heat/Pacers Eastern Conference Finals (unless there’s a major upset which there probably won’t be). The West is going to be very hard to predict and anyone could come out, but in all likelihood it will probably be someone besides the Thunder or the Spurs. Mainly because I don’t trust Durant in the postseason, and also due to the Spurs Finals failure the year before. I still think the Heat are going to win the title, but you never know I could be wrong. Best of luck to all your teams this basketball season.